Answer: As we say in the astronomy business, good eyes! What you saw is called earthshine. It’s usually visible for a few days after the New Moon, and can sometimes be visually striking. What’s happening here can be seen in the diagram. I took this photo of a particularly good example of earthshine just a few Moons ago. The bright part of the Moon, what we call the Crescent, is lit by the direct rays of the Sun. We can’t see the Sun at this point, since it’s now below our local horizon (the Hieroglyphic Mountains west of New River in this case). But its light still illuminates the side of the Moon that’s facing it. The “dark” part of the Moon faces away from the Sun, and is thus unlit by direct rays. Of course, it’s still daylight over California and most of the Pacific Ocean. 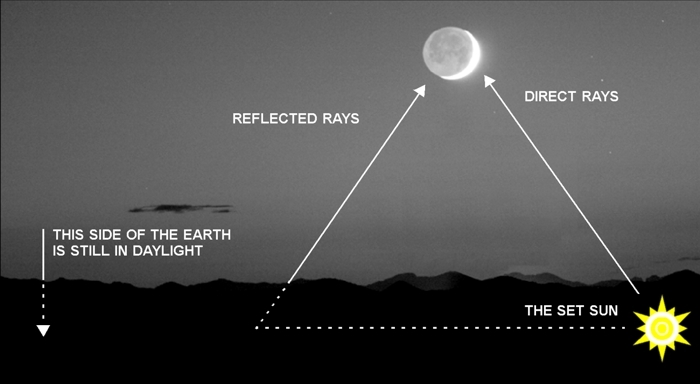 Sunlight that hits this region of our planet reflects back off into space, and illuminates the “dark” part of the Moon. This is called earthshine. If you were on this part of the Moon, and looking back at Earth, you’d see a brightly lit “Full Earth” illuminating your “night” just like the Full Moon can do during nights here on Earth. According to the astronauts who’ve actually been there, the “Full Earth” is much brighter than a Full Moon. Not only does it appear almost 4 times larger, but it’s much more reflective, being covered by mostly water and white clouds. Check out this graphic simulation. Plus, you can often see a reflection of the Sun off the ocean. The Moon, by comparison, is covered with not-so-reflective gray dust. The fact that a Full Moon looks as bright as it does is amazing, when you think about it. But then, that just tells you how bright the Sun is. Sometimes the earthshine is so bright you can make out the craters and other features with your eyes. The fact that the Pacific Ocean is west of us helps, as it is much more reflective than land. So not only are Arizona sunsets some of the best, but we also have great earthshine!